This claim is false of course, and stems from a confusion of terminology. The false 75% figure, and others like it, actually refers to the approximate number of non-tenure track “contingent” faculty in the United States – a number that includes several hundred thousand full time professors who have renewable appointments with benefits and are paid at levels comparable to a tenure track hire. Adjuncts actually comprise about 45% of all faculty when you include the heavily distorted for-profit college industry. In traditional not-for-profit higher ed, adjuncts only make up about one third of the faculty. Even still, the false figure claiming that three fourths of all faculty are adjuncts is ubiquitous in media reporting on adjuncts (see here, here, here, here, and here). One of the main culprits in disseminating the false statistic is the American Association of University Professors, which includes a “fact sheet” on its website that fails to adequately differentiate adjunct faculty from simple non-tenure track appointments. Rather than correct or clarify this figure in light of the near-weekly repetition of its erroneous use to describe adjuncts, the AAUP has actually (some might even say intentionally) added to the confusion. Last summer when I pointed out the pervasive repetition of the “three quarters adjunct” claim in mainstream press reporting on the adjuncting movement, tenured professor and AAUP blog editor Aaron J. Barlow went so far as to accuse me of lying about its misuse. Adjunct Professors are part-time contract faculty who are hired to teach a single class. Their compensation varies by university and the number of credits taught, but it tends to average around $3,000 for a typical undergrad class. This contract is usually inclusive of a fixed period of instructional time and associated classroom administrative activities (office hours, grading, lecture preparation). It typically contains no other obligations however in terms of research, university service, or departmental obligations. Adjuncts do not typically receive benefits such as health insurance through their employers, as they are officially considered part-time positions. Non-Tenure Track Professors are faculty who receive a faculty appointment for a fixed number of terms at a university. During the course of this appointment, the non-tenure track professor is a full-time employee of the university and enjoys standard benefits such as health insurance, as well as participatory rights and expectations in faculty governance. Full time contracts are often for a 1-year period, though terms of appointment vary and can extend for multiple years. Some of these contracts are indefinitely renewable at the discretion of the department. While salaries and arrangements vary for these positions, the average is just under $50,000 a year, which actually makes it comparable to the starting salary for a tenure-track position. In addition to teaching, which is usually specified in the appointment, full-time non-tenure track faculty are also usually expected to conduct research and contribute to the department and university. Unlike an adjunct, both research and university service are also usually components of their salary. Non-Tenure Track faculty might also be further broken down into two subcategories: Contract and Visiting. Most multi-year renewable positions are contract faculty, though a few also fit a fixed term defined in the hiring agreement. Visiting faculty sign on to their post for a typically shorter term, such as a single semester or a single year. Persons in this group may be seeking a more permanent long-term position elsewhere, though others may be established scholars who come to visit at a different department or locale while conducting research and/or teaching in a different academic environment than their usual place of employment. In either case though, the salary and benefits are usually directly comparable to a similar-rank tenure track position. Tenure-Track Professors are early-career faculty who are hired into what will become tenure-eligible positions after a number of years on the job, pursuant to those faculty meeting a number of performance expectations. The average starting salary for a tenure-track position is around $50,000 a year, which makes it only slightly higher than a non-tenure track appointment. Their expectations are also comparable and include a mixture of teaching, research expectations, and university service. The main difference between tenure-track faculty and their full time “contingent” counterparts is that tenure-track faculty are eligible to apply for tenure after a number of years on the job. This usually takes place after about 6 years in a position, with some variation by institution. Tenure is obtained by submitting oneself to a tenure review process. During this review, a group of senior faculty in the department and school will examine various indicators of the faculty member’s performance including scholarly research published during the previous 6 years, service work for the department or university, evidence of teaching ability, and even factors such as being a good co-worker and colleague. Persons who meet these expectations are then granted tenure. Those who do not are usually given a grace period non-tenure appointment during which they are encouraged to seek another job. Tenured Professors are mid-to-late career faculty who have successfully passed tenure review, which is in many ways akin to a promotion after several years of research output and service. As senior figures in their departments, tenured faculty are usually compensated at progressively higher levels as they advance through the ranks. Salary for tenured faculty varies wildly, and may range from a comfortable mid-five figure package to well over six figures. Like all other full time appointments, they receive benefits such as health care. Tenured faculty also have teaching, research, and service obligations, though these too diminish in conjunction with the promotion. Many tenured positions come with increased rights and obligations in faculty governance, such as increased decision rights in the hiring of new faculty and – of course – reviewing other colleagues for tenure. 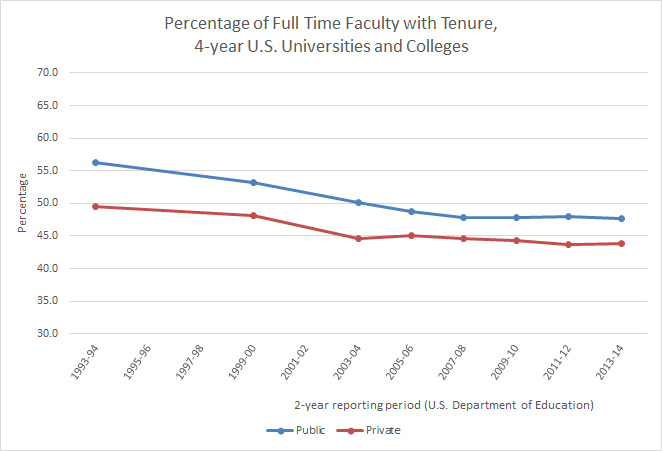 The main benefit of tenure for many is that faculty who successfully obtain it have near-permanent job security for the remainder of their lives. At most universities, tenured faculty may only be fired over severe misconduct. Accurate statistics are often hard to come by for each of these categories, though as mentioned above the “full-time” category (meaning non-tenure track, tenure track, and tenured faculty) comprises a little over 50% of all university faculty and closer to 70% of traditional not-for-profit university faculty. Adjuncts comprise the remainder, with their largest concentration being in the for-profit world. 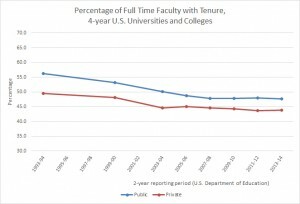 At the present, about 45% of all full-time faculty are tenured. The remaining 55% are either tenure track or non-tenure track. 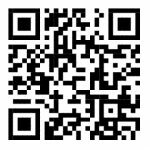 This entry was posted by Phillip W. Magness on Tuesday, December 8th, 2015 at 3:57 pm	and is filed under Uncategorized. You can follow any responses to this entry through the RSS 2.0 feed. Both comments and pings are currently closed.